This morning was a lovely practice. My hips were rotating a little easier than usual and lotus may have been slightly less effort, although still no getting arms through for garbha. I had less tightness in my knees and, for me, that was real progress. I think I even made it a little farther than usual in the evil janu C, I could bind the wrist of the first side and the second side felt less awful. I only made one half-hearted attempt at the bhuja jump, then just did the pose. Supta k was really good today. I got an assist and my fingers were touching, feet together, no hamstring weirdness. 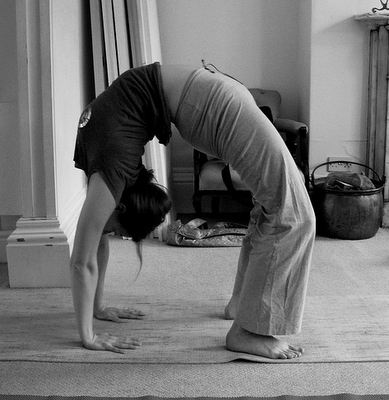 Back bends were ok. My stand up from UD was great, no steps required. I did about 7 drop backs and some were great, some required a stumble or two. My assisted back bend was intense today. My fingers went under my heels, but my super tight psoas’ meant I couldn’t get those heels down at all. I think once I stretch our the front of my hips, my back bends are going to be great because I think my spine is quite bendy. Anyway, it was fun today, regardless. Last week was tough with my breathing being impeded by my cold, but it seems to be letting up so I think this week is going to be a good one. On another note, I’m reading Guruji and loving it. It’s amazing to read about the journey of practitioners who have been on the ashtanga path for many years. It certainly fuels my desire to make the pilgrimage to Mysore to completely be immersed in the practice. Maybe next year, I hope.